For the past two or three years I have been teaching a series of classes called “Inspired Cooking by the Book.” The idea of the series is to teach recipes culled from the cookbooks that tend to get the most use in my cookbook library: those that have been written by chefs or seasoned cooks and that are either organized by the season…or by ingredient. As regular readers know, I really do cook and eat seasonally. No matter what the season, I shop for food in a produce-centric way, choosing what looks good at the moment (whether at the farmers’ market or grocery store) and then supplementing with meat, fish, eggs, cheese, grains/pastas/legumes, etc. When I’m faced with the inevitable “what are we going to have for dinner?” question—and I come up blank—these kinds of cookbooks provide the perfect inspiration for cooking with what I already have in my fridge and pantry. Sometimes I don’t change the original recipes at all for these classes. And in some cases the original recipe is really nothing more than a spring board. 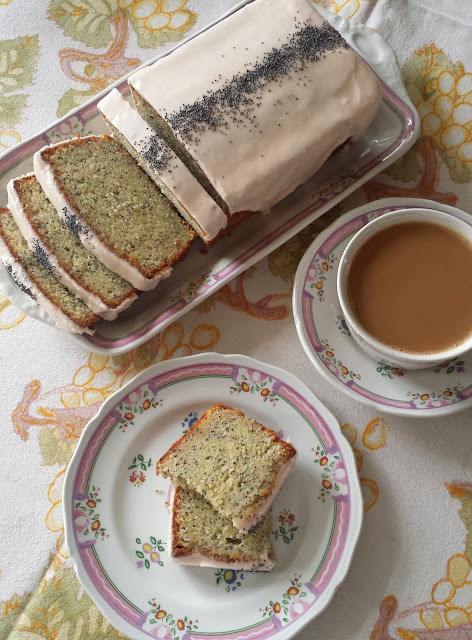 The title…or picture…or list of ingredients…appealed to me, but the actual recipe wasn’t what I wanted or expected, so I just create my own recipe using the things that inspired me about the original recipe. In either case, the resulting recipes make for interesting classes of seasonal foods that provide some insight into the daily home cooking habits of a professional chef. The classes have been immensely popular and I am currently in the middle of round 2 of the series. In the winter installment of the series this second time around I included a recipe from Deborah Madison’s Local Flavors for Celery Root & Wild Rice Chowder. 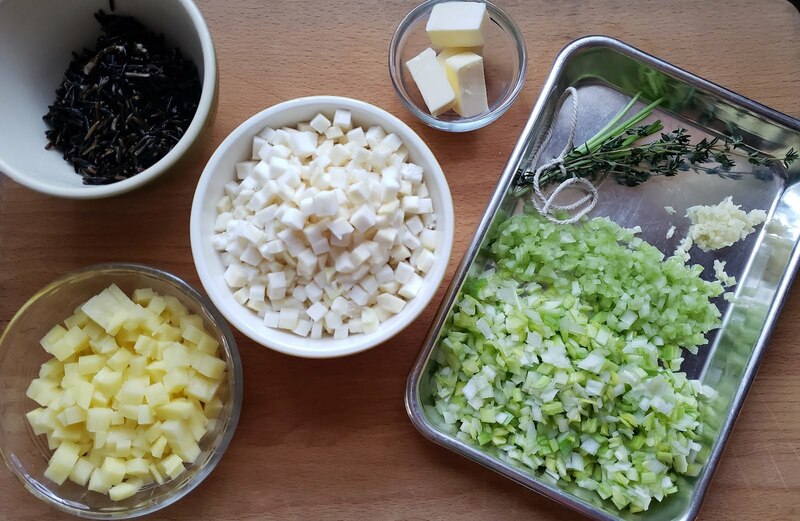 I was attracted to the combination of celery root and wild rice (a fantastic, earthy, pairing). And I was intrigued by the fact that she called this a “chowder.” The origin of the term chowder is open to debate (generally thought to have something to do with the name of a cooking vessel), but with few exceptions, it refers to hearty seafood and/or fish soups. The fact that these soups almost always include chunks of potato…and cream or milk (in which case they are generally thickened with a roux)…has led to a few variations that don’t contain seafood. Corn chowder and potato chowder come to mind. This soup does indeed include chunks of potato and heavy cream. And it has the rustic feel that I associate with a chowder. 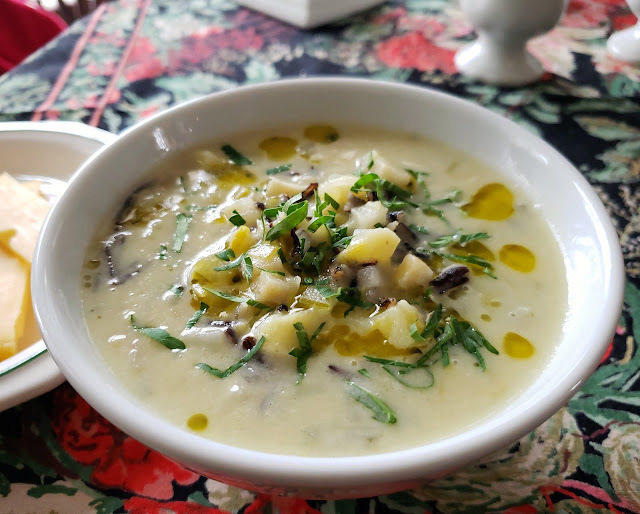 If I hadn’t known the name, but had been served a steaming bowl of this soup—with wild rice and little chunks of celery root and potatoes suspended in a rich, creamy base—I think I would have dubbed it a chowder, too. I changed the chowder very little from Madison’s original (it definitely still qualifies as a chowder!). I increased the quantity of broth, potatoes and wild rice a bit…and elected to stir the rice in (rather than placing a mound in the center of each bowl). It is delicious…and it keeps well (reheating beautifully without becoming overly thick and stodgy). 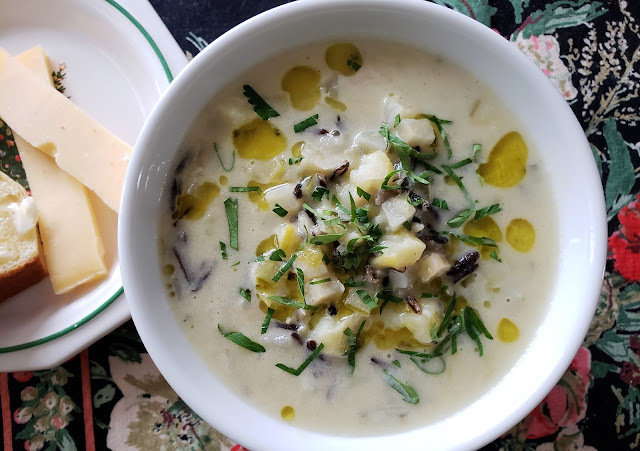 And as one would expect from a chowder, I have found it to be especially satisfying during our recent spate of cold and unusually stormy weather. If time, soak the rice (see note): In a medium bowl, pour boiling water over the wild rice. Allow the rice to soak for one hour, then drain. Place the rice (drained or raw) and the stock in a large saucepan and bring to a simmer. Simmer until the rice is just tender—about 30 to 40 minutes. Strain, reserving the stock and the rice separately. Measure the stock and add water to make 4 cups. Melt 2 T. of the butter in a large saucepan set over medium heat, sweat the celery and leeks until beginning to soften—about 5 minutes. While the celery and leeks cook, tie the herb stems securely together with a piece of cotton kitchen twine (see note). When the leeks and celery are ready, add the remaining tablespoon of butter. When the butter has melted, add the celery root and herb bundle along with a good pinch of salt. Cook until the celery root is beginning to soften on the surface and all the vegetables are sizzling gently—about 5 minutes. Add the reserved stock and potatoes. Bring to a boil. Reduce the heat to a simmer and season to taste with salt. Simmer gently until all of the vegetables are tender—about 20 minutes. Using a slotted spoon, transfer a cup of the vegetables to the cup of a blender or immersion blender. Add enough of the cooking liquid to cover the vegetables and purée until smooth. Scrape the purée back into the soup pot. Add the heavy cream. If the soup is too thin, purée some more of the vegetables. If it is too thick, add some water or stock or milk. Taste and correct the seasoning with salt and pepper. If the soup is well-seasoned but still tastes bland, add a squeeze of lemon to lift the flavors. Add the rice, bring to a simmer and serve garnished with a drizzle of olive oil and a sprinkle of parsley. Makes a generous 1 1/2 quarts soup—serves 4 to 6. Soaking the rice will cut down on the cooking time only slightly. The main reason to do it is that it helps the rice absorb water more evenly as it cooks. If you don’t have any kitchen twine, you can of course just throw the herb sprigs/stems into the soup. Just remember to count them so you will know how many to fish out of the soup before you serve it. Because this is chowder—and I associate bacon with clam, potato and corn chowders—I think bacon would be a delicious addition. Cut 2 slices (about 2 oz.) of bacon into 1/2-inch squares. In the soup pot, render until just beginning to crisp. Add enough butter to make 2 T. Add the celery and leek and proceed with the recipe. 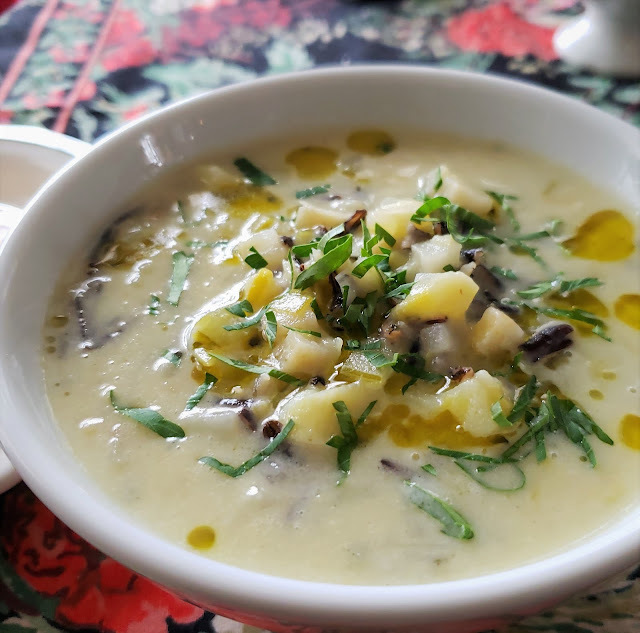 Deborah Madison suggests drizzling a bit of truffle oil over the soup. If you happen to have some on hand, it would be delicious in place of the olive oil. I think a nut oil—particularly walnut or hazelnut oil—would also be good.